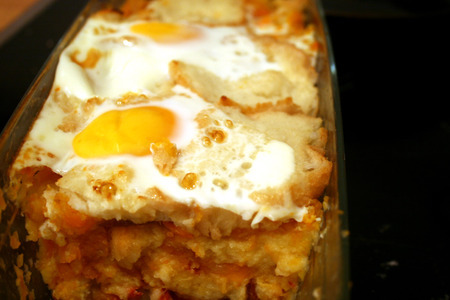 A few weeks ago I brought you Baztan sopa, a soaked bread concoction typical of Navarra's mountain cuisine. Well it turns out those thrifty countryside folks really love their soaked bread dishes. I found a recipe for another, called costrada, and decided to try it out. The result? A certainty that Americans did NOT invent the breakfast casserole...this dish is toasted bread layered with chorizo and tender, pureed carrots and onions. With a few generous cupfuls of broth, you stick it in the oven and the flavors meld together. Then, to finish it off, you can top it off with a couple eggs. Its ingredient profile is revealing: bread, root veggies, eggs, chorizo-the stuff that you have laying around the house if you live in a baserri in the mountains. It's a peasant dish. But it sure is delicious. Toast the bread in a hot oven. Boil the onions and carrots in salted water until tender; puree. Lightly fry the chorizo in a little bit of olive oil. 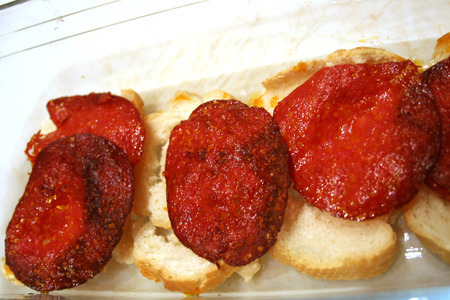 To construct the dish, begin in a 8X4 or thereabouts container, layering one layer each of bread, chorizo, and vegetable puree. Repeat until all the ingredients have been used. Pour over the stock and put in 400 degree oven for about fifteen minutes. Add liquid if you see that it's getting dry. A few minutes before it's ready, crack eggs over the top and broil until they are set.